Yoppapie report　Is my Gibson guitar contraband? Is my Gibson guitar contraband? 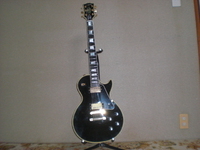 According to a news , Gibson guitar company was accused of illegally importing ebony from Madagascar and India, as well as rosewood from India. Gibson will pay a $300,000 penalty to avoid criminal charges for importing ebony and rosewood. I have checked whether my Gibson Guitar used illegal material or not. Following is the specification of my guitar.